First, Epic released Fortnite: Save The World and got positive reviews about it. It’s cute art style, sassy humor, and lovable characters made it a hit. Then it released a BR mode, one that was modeled after the current genre but had certain twists that made it unique, specifically the building portion. This SKYROCKETED Epic into a new level of celebrity, with Fortnite in commercials, on cars, on underwear. Fortnite is everywhere. So what else can Epic do to make a mark? Restaurants? Stocks? Start its own country? Nope. Instead, they set their eyes on the Game Store market. In fact, a lot of companies past and present have tried this model before. Steam is the daddy of all when it comes to markets, but Ubisoft and EA both sport different stores of their own. Discord just made the leap from massive communication to game store, opening theirs inside the Discord app itself and allowing users to see up-to-date data about who’s playing what and a newsfeed of games that they play. Even Twitch took a crack at it. Epic seems to be taking this route too, but for a different reason. Developers, the funny people that dedicate their lives for other’s enjoyment, tend to pay a cut whenever hosting from these markets. The market takes a cut for hosting and advertisement while the company or developer take the rest of the revenue. When you’re a single person, it seems decent. When you’re a company paying employees, the pot grows smaller for profits. 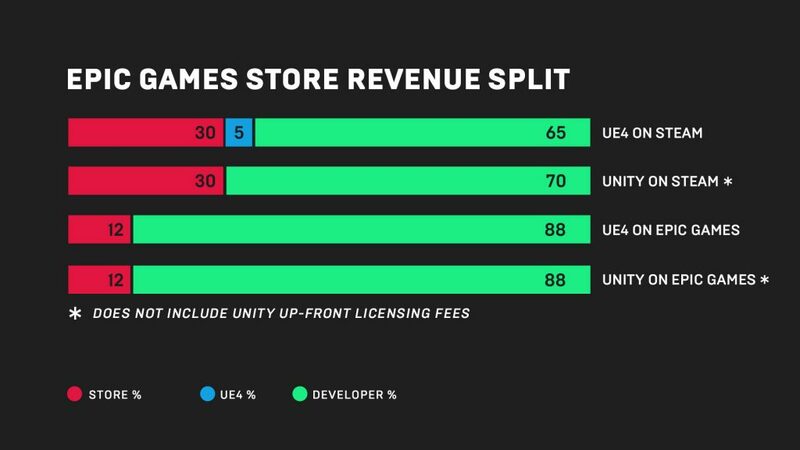 The division of revenue that Epic Games aims to achieve, versus Steam. So Epic wants to offer developers the best possible cut for their products while still maintaining a profit on their end. The store will open offering developers a flat 88% cut of the revenue. No fees or gimmicks, even the Unreal Engine fee is covered by Epic. 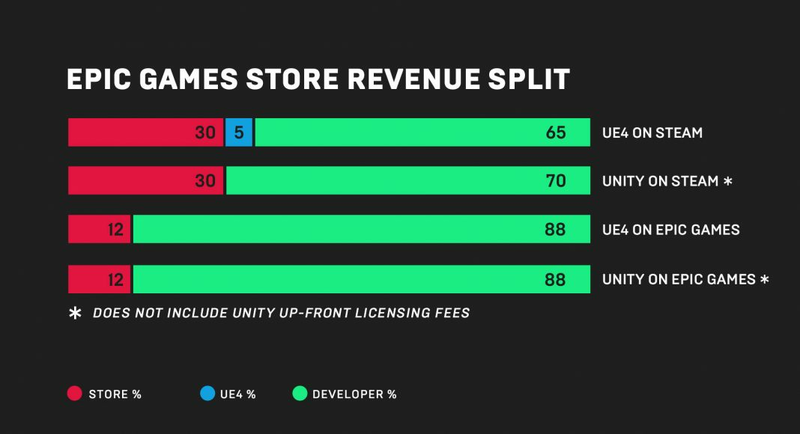 The revenue is a huge step towards funding developers for the future, especially small indie companies that need as much as they can. Even if a game is successful, the amount it takes to run it, develop it, and even consider a sequel can be more than a small company can handle. Not only is the revenue share excellent, but Epic also looks to connect developers directly with players by having them automatically connect to the news feed once they purchase a game. This helps to keep players in the know on key updates, future ideas, and general feedback for development. It runs deep when players and developers are able to guide the future of a game, side by side. Developers will also be connected to their own game page and can make changes how they see fit. No more competing games appearing right below your game’s description or competing ads being run left and right. Epic will allow developers to offer participants in the Support-A-Creator program a chance to earn a share of the revenue by referring people to the game, even covering the first 5% of the sharing revenue for the first 24 months. All in all, this could mean serious competition for the Steam community. Very few have touched the mega giant that is Steam but, with all the plans ahead, it might be time for Steam to see others are starting to reinvent the wheel. 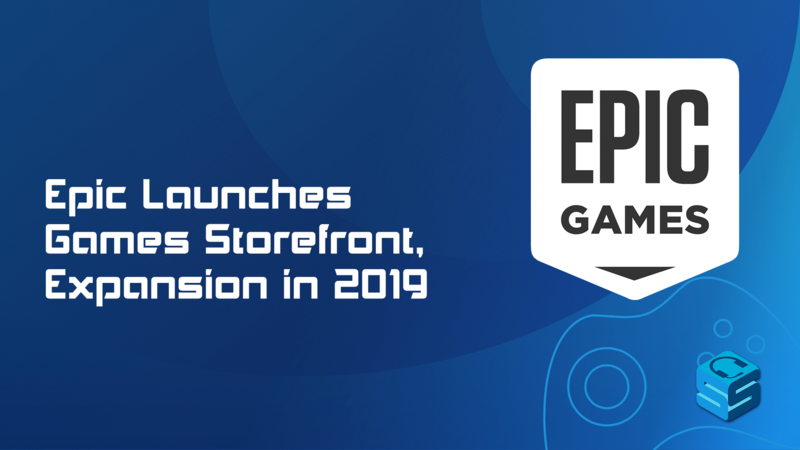 Following a presentation at the Video Game Awards, the Epic Games Store has launched with a library of hand-curated games, and will expand to a broader set of games and platforms in 2019.